Ancient records say that Adi Shankaracharya lived and meditated on this hill. For centuries, the hill has been known as the Shankaracharya Hill. However, the information plaques have suddenly been changed to read as Takht -e-Suleiman Or ” Throne of Solomon “. 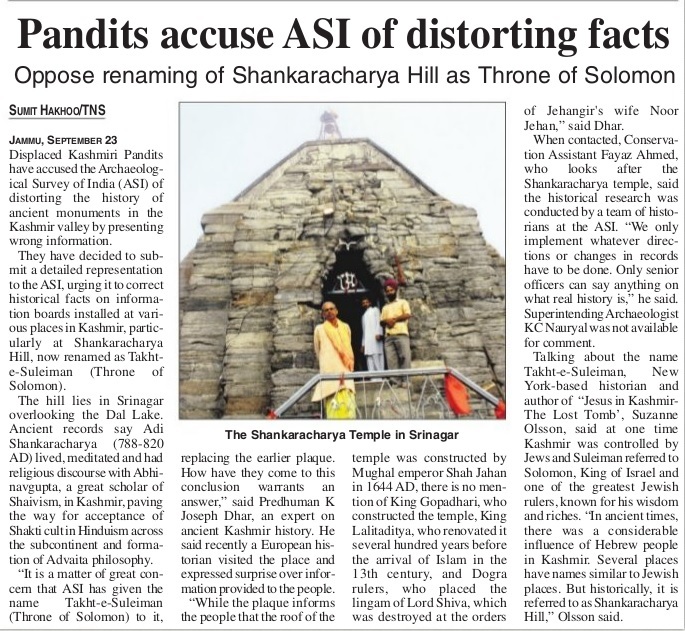 This is yet another link in the process of appropriation of Ancient Bharat’s symbols by the “secular” brigade continues . The aggression on Hindu ethos continues. This entry was posted in Hindu Dharma, History, Nation, Threats and tagged J&K politics, Shankaracharya on September 26, 2013 by arisebharat.